Necessity opens with an aged, mortal incarnation of the son of Zeus, Apollo, dying and immediately undergoing apotheosis. This is also the same day that the first human spaceship contacts Plato, the planet where Apollo has been living with his family and fellow inhabitants of the Just City experiments for some decades. Neither of these things is the focus of the story. In the first book of the Thessaly trilogy, The Just City, the goddess of knowledge, Athene, decided to experiment with setting up Plato’s ideal city by snatching (at the moment of their deaths) adults from all over history to be teachers in a new city, and purchasing enslaved children who would learn to be philosopher-kings. Additionally, Apollo chose to incarnate in order to explore the idea of individual significance. For all that it involves gods, The Just City is not a particularly fantastical or science fictional book; the focus is on (deeply interesting) philosophical discussions about justice and significance. The follow-up, The Philosopher Kings, had slightly more action and less discussion, as the original city fragmented and different people set up their own versions of just cities. It was somewhat more fantastical, as mortal-Apollo’s children manifested godly powers, and it went full tilt science fictional in the conclusion where Zeus transported all of the cities physically to an entirely new planet, and temporally into the future. This planet is where Necessity opens, a generation or so after Zeus’s intervention. This third novel, too, is less philosophical than The Just City, although it continues to explore interesting ideas. It is the most science fictional (or fantastical, depending on your categorisation) of the trilogy, with humans interacting with aliens and gods on a regular basis. Despite opening with new humans arriving, much of the novel’s action focuses on the fact that Athene has gone missing and that Apollo and Hermes must find her before Zeus realises what she’s done—which is to go outside of time itself, into the Chaos that is before/after/outside of time. To do so, the gods must search through time for the clues she has left them. This is the first time in the trilogy that Apollo is acting fully as Apollo, rather than his human incarnation, and his understanding of human significance impacts positively on his interactions with mortals, and even with other gods. By contrast, Hermes comes across as an unpleasant character because he cares little for individuals. This is compounded when it’s revealed that Hermes is not Hermes, but actually an alien god, who has been manipulating situations and people (including gods) for his own ends for quite some time. Through this comparison, in particular, Apollo’s development as an individual is highlighted. At the same time as gods are being rescued, the novel is also focussed on character interactions back on Plato. Its inhabitants include people who may be concerned for Apollo and Athene, but whose immediate focus is on their own lives—love and friendship and getting enough fish to feed everyone. This has been a strong current throughout the trilogy, and Walton delivers these different aspects through her various narrators. Apollo is the only consistent narrator across all three novels, and in this book he is very focused on Athene. It’s the human narrators that I have generally found most interesting. In this instance, the two dominant voices are Marsilia, one of Apollo’s human descendants and newly elected consul, and Jason, a young man who accidentally gets involved in the godly goings-on. Marsilia is a Gold, which means that she has been found to be one of the most excellent citizens, one of Plato’s philosopher-kings who can be trusted with the running of the city. Jason is a Silver: not quite as excellent as a Gold, but still trusted with important work like fishing for the community. The justice and appropriateness of this division of people into categories is one of the recurring themes across the novel, since Marsilia also likes going fishing, and Jason is clearly a deep thinker; Thetis—Marsilia’s sister—is a Bronze, and works in childcare (which is worthy but not highly prized), but/and is also someone who thinks deeply about issues. Because of her categorisation, she frequently talks herself down—a reaction that the novel interrogates. An additional, and wonderful, voice is added via occasional chapters from the perspective of Crocus, the first of the Workers (machines imported by Athene back in The Just City) to develop sentience. Through him we get a rumination on why the Workers became conscious—perhaps as a result of their having to set priorities—as well as a non-human perspective on what it means to live a just life. These chapters also provide a more disinterested perspective on the humans, and fill in some of the gaps in the history of Plato. Crocus’s presence meshes neatly with Apollo’s realisation about humans having equal significance: Apollo was forced to concede significance to humans, while machines developing the ability to be philosophers forces humans to concede it to non-humans—which is fortunate given their later interactions with aliens, who also demonstrate a capacity for philosophy. 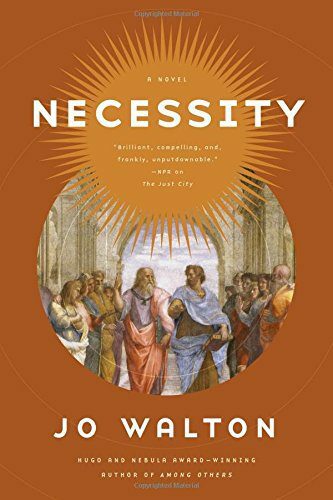 Overall, Necessity blends deeply philosophical questions about what it means to be conscious, what it means to be excellent, and what it means to do the right thing with a bit of action and delightfully individual characters. One thing that did, and does still, confuse me, however, is why that human spaceship is part of the story. Its presence does lead to some interesting philosophical discussions about whether humans ought simply to do what gods tell them to do when the gods are definitively real, and there are some nice moments of cultural confusion around the Just City inhabitants not understanding capitalism as a driving force. But—for an event that would surely end up being revolutionary for the planet and the arrival of which is set up, at the opening of the novel, as an incredibly significant moment—it plays a surprisingly minor role in the narrative. The philosophical discussions could easily have been had around some other issue connected to the dominant action. It almost feels like the set-up for a further novel in the sequence. If that ends up being the case, I will be in raptures to read it; but as it stands, it feels like an unresolved plot point.